This is a rarity among restaurants. Bringing wine to a restaurant is a common practice among wine aficionados. However, there are some unwritten rules to consider should you decide to bring one of your favorite wines to a restaurant. The wine should be special, something that is unlikely to be on that restaurant’s wine list. It might be a wine from a boutique winery or wine that is available only at the winery. Or, the wine might be one that has been aging in your wine cellar. In short, it is a unique wine. It is always a good idea to call ahead and ask the restaurant about their corkage fee. Fees will vary, but some restaurants will charge an outrageous corkage fee. For example, a recently opened fancy San Francisco restaurant charges $50. 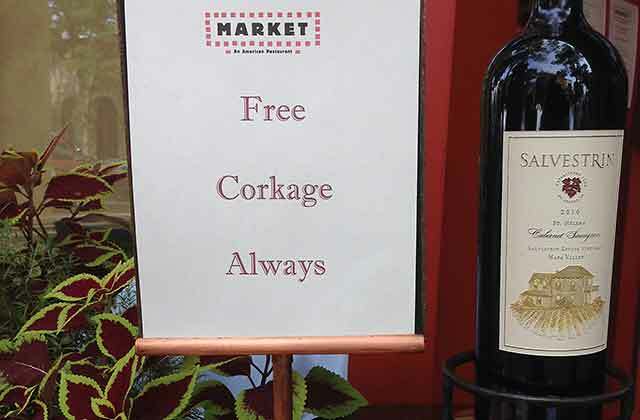 Expect to pay from $10 to $20 for a corkage fee. Expect to pay a higher corkage fee for a magnum of wine. For a very special bottle, consider offering the sommelier or waiter a taste of the wine. A few restaurants will waive the corkage fee if you purchase an additional wine from the restaurant. A few wine country restaurants will waive the corkage fee if you bring a wine from the wine region where the restaurant is located. We hope this is a growing trend in the wine country. If you are eating at a neighborhood restaurant or any restaurant that does not have a great wine list, you can bring a wine that is not so distinctive, but one that is of good quality and, of course, not on their wine list. Two Napa Valley wine country restaurants that I know of that do not charge a corkage fee are the Rutherford Grill and Market in St. Helena.